Globus Arima LEGEND is in the heart of the business hub, yet above it all. 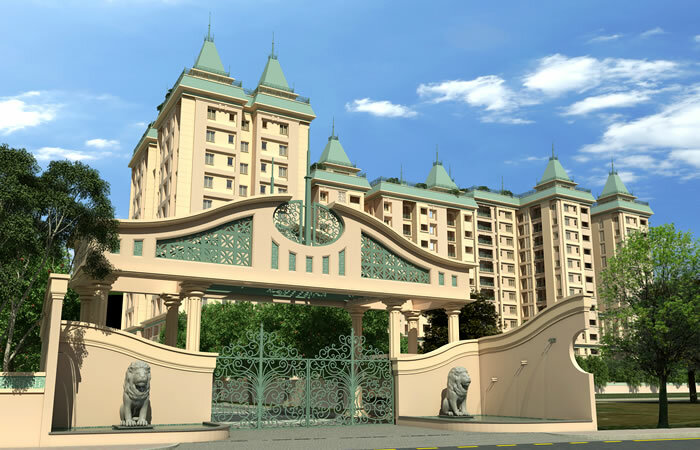 This magnificent 13 storey tower offers elegant 2,3 and 4 BHK apartments. From the classical style architectural planning to the smallest comfort, every little detail has been carefully thought out to give you an unparalleled living experience. The Landmark encompasses a few distinctive features. a) COVETED LOCATION – Nestled in the commercial heart of Coimbatore on Avinashi Road at Nava India, this landmark boasts easy access to the railway station, the airport, the city bus stand and various schools, colleges, hospitals, restaurants and shopping complexes. b) A 30,000+ SQ. FT. CLUBHOUSE – Expansive and elegant, LEGEND clubhouse plays host to every leisure pursuit you could think of – a top-flight gym, a full-size swimming pool, an indoor games room, a Shuttle Court, a tranquil yoga centre to name a few. c) THE LEISURE CORNER (Drawing Room) – Gather for a family conversation in the spectacular living room over a cup of coffee or catch your favorite television program. It`s the ideal place to entertain your guests and spend some quality time with them. d) THE SPACIOUS REJUVENATION ZONE (Dinning Room) -Enjoy a quiet lunch or dinner with your near and dear ones at the sophisticated and trendy dining area. e) THE PEACEFUL OASIS (Bedrooms)– Spacious bedrooms offer you maximum levels of comfort. Enjoy some priceless moments in the large, cozy, quite atmosphere of the rooms. f) THE FIRST IMPRESSION ( Entrance Lobby) – The vast double-height main lobby has been specially designed to make you feel the luxury and grandeur of your home from your very first step. CRAFTED TO PERFECTION, FOR THE DISCERNING FEW. It is often said, the best things in life come to those who wait. We understood and have saved the best for YOU. IT’S TIME. TO CELEBRATE YOUR SUCCESS.